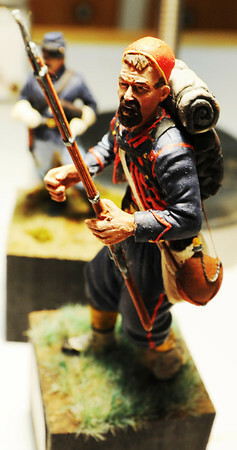 A detailed miniature of a member of the 9th New York Volunteer Infantry, known as Hawkin's Zouaves, who fought in Sharpsburg, Md., built, painted and based by Terry Barton of Pittsburg, Kan., Thursday afternoon, Sept. 26, 2013, in Barton's home. Barton said he researches his work to make it as historically accurate as possible with period uniforms and detailed bases. Some of his bases even incorporate actual grass from historic Civil War battlefields.